IT Cosmetics BYE BYE FOUNDATION 50+SPF 4 piece SET KIT MEDIUM SHADE NEW! jendemarco777 has no other items for sale. 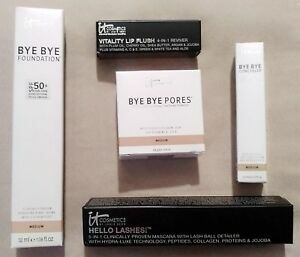 Details about IT Cosmetics BYE BYE FOUNDATION 50+SPF 5 piece SET KIT MEDIUM SHADE NEW! IT Cosmetics BYE BYE FOUNDATION 50+SPF 5 piece SET KIT MEDIUM SHADE NEW!